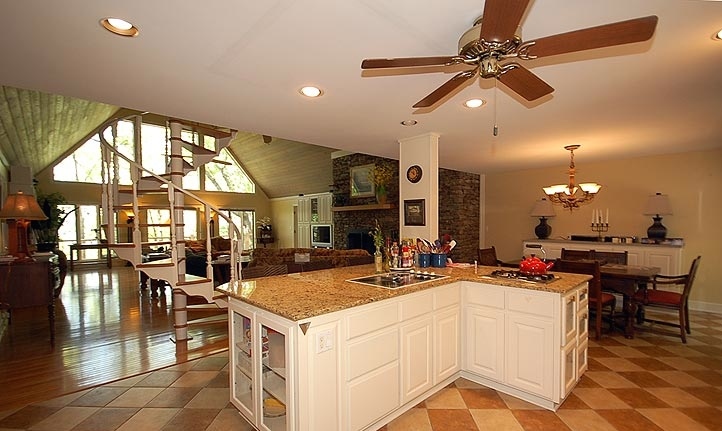 This chalet style house was built in the late 90’s on Greers Ferry Lake in Arkansas. The house had "good bones" to start with but had not been updated since it was built. It also had a lot of square footage but only two real bedrooms. Our two biggest goals for this project were to create maximum sleeping space and to aesthetically improve the house by giving it a more rustic look that would reflect the natural surroundings of the house. 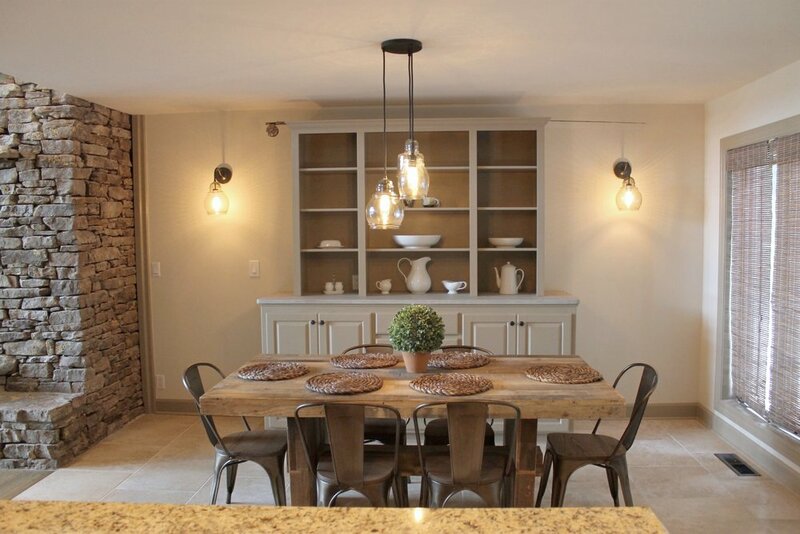 We felt like using neutral tones was very calming and suitable for a vacation house nestled in the woods. The kitchen already had a nice layout and adequate storage so we reused to existing cabinetry. 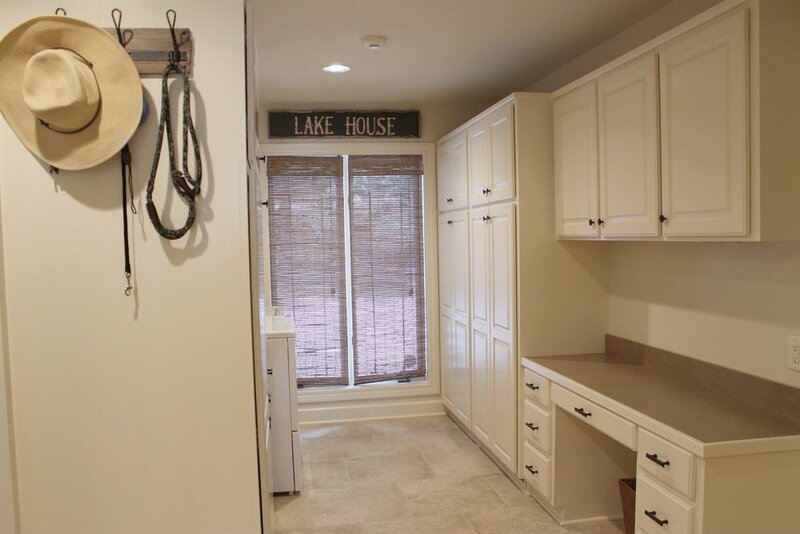 The white cabinets were painted a ‘griege’ color (gray brown) to give them a more rustic look. 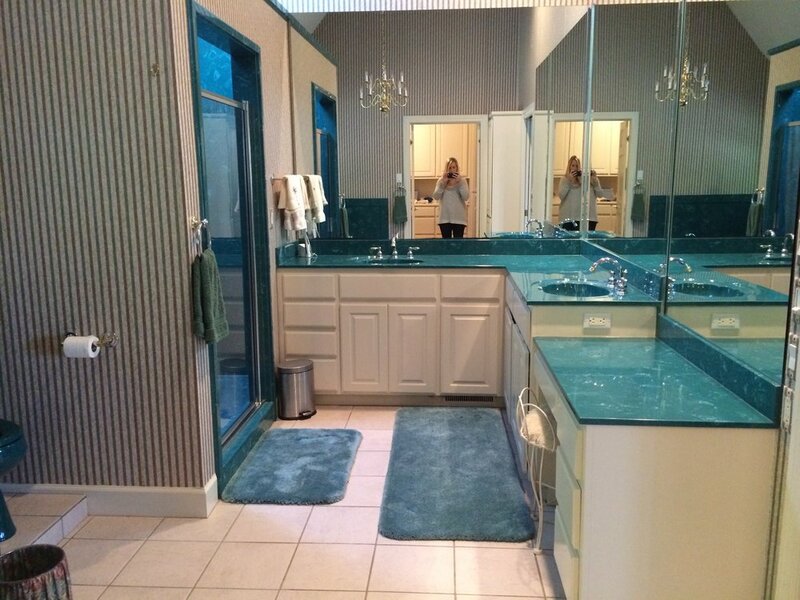 We were also able to reuse the existing granite counters. The busy checked tile floor was replaced with large neutral ceramic tiles. Natural wood shades replaced accordion white shades. A reclaimed wood breakfast table helped to give the lake house feel. The open floor plan and paneled vaulted ceiling were some of the best features of the lake house. 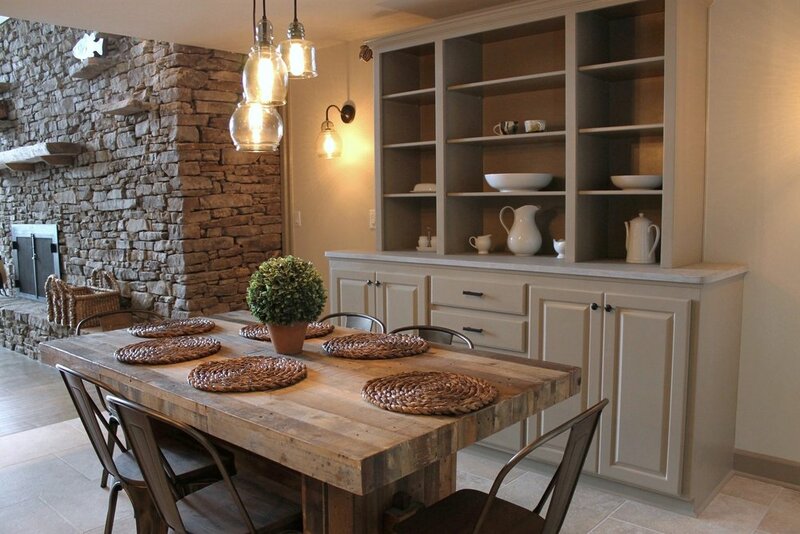 The large Arkansas stone hearth is definitely the focal point of the space. In fact, the entire color scheme of the house was inspired by the colors of the stones. The floors, cabinets, furniture, and rug all fall within the same neutral color palette. The overall effect is one of uncluttered peacefulness. The giant ‘U’ shaped sectional is comfortable, inviting, and maximized the seating capacity for entertaining. Sharing the space in the living room is a dining area with a long farm table and benches positioned to take advantage of the beautiful lake views. Narrow spiral stairs were replaced with a curved floating wooden staircase. The stairs add an architectural element without obstructing the view. This space was almost reduced in half to allow for a full bathroom off the guest bedroom instead of just a half bath. The cabinets in this space were retrofitted in some places so as not to waste any storage space. Floors and countertops were neutralized for a fresh look. Coat hooks were added to hallway to function as a mudroom off of the garage. This large space was divided into both sleeping and a sitting areas. In an effort to give the room more of a lake house look, the yellow walls were painted taupe, the golden floors were stained greige, gold fixtures were replaced with bronze, window valances replaced with natural wood shades, and the dark stained mantle was replaced with an old beam with a stone surround. The vaulted ceilings were emphasized by adding two fans and a chandelier. All the faux green marble was replaced with neutral tile and river rocks. The striped wallpaper was replaced with neutral paint color. The original cream cabinets were reconfigured. Bronze pulls and fixtures replaced gold ones. A water closet was added with double doors for privacy. The huge Jacuzzi tub was replaced with a deep standard sized tub with tile surround. The ceiling was paneled with stained wood similar to that in the living room. The effect makes the master suite seem special. 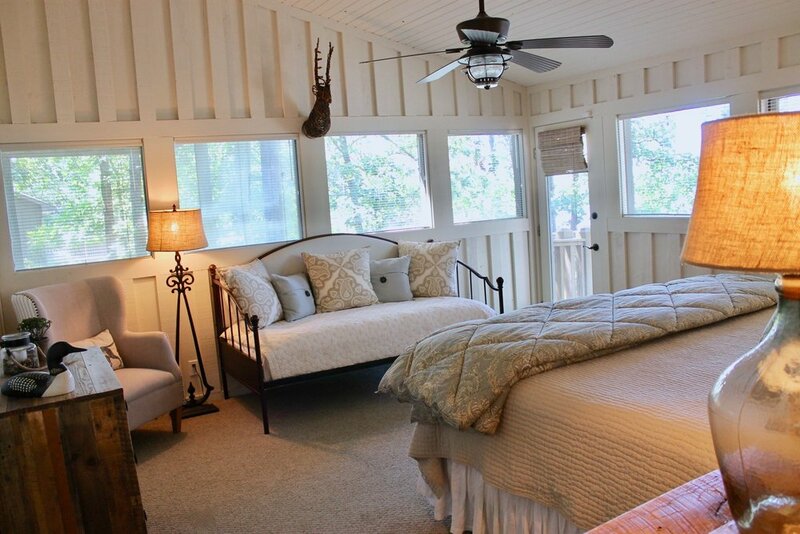 This bedroom was once a screened in porch. The walls and vaulted ceiling were still painted the same color as exterior board and batten. The room color was changed to off-white to soften the feel of the rough Cyprus wood. The furniture consists of rustic wood, wicker, and reclaimed wood. 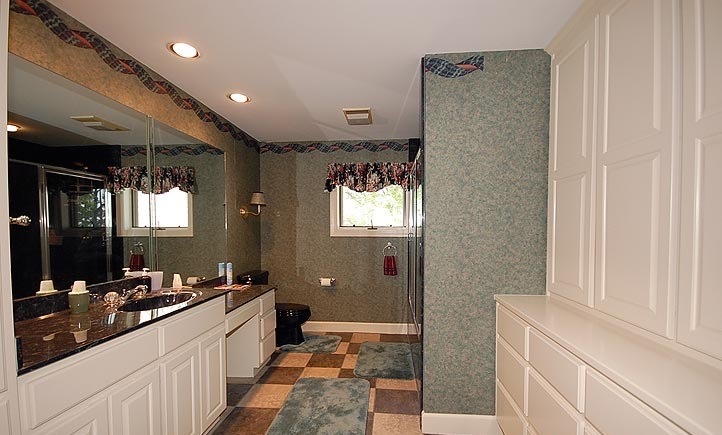 The adjacent bathroom can be used either as a guest bath or a private bathroom if locked off. The colors are soft tan, cream, and blue to mimic the lake. The open landing at the top of the stairs previously was used as some sort of office with a built-in desk and gun cabinet. Both built-in’s were removed and replaced with three twin beds to maximize the sleeping space. The open spindle railing was replaced with a half wall for more privacy for guests staying in the space. Before renovation, the square footage upstairs was being used very inefficiently and slept very few people. We fixed this by creating these two long, narrow bedrooms by dividing one very large vaulted bedroom in two, which in turn gave us three times the sleeping capacity. One bedroom has a nautical blue color scheme while the other bedroom is blue-green reflecting the colors of the lake. 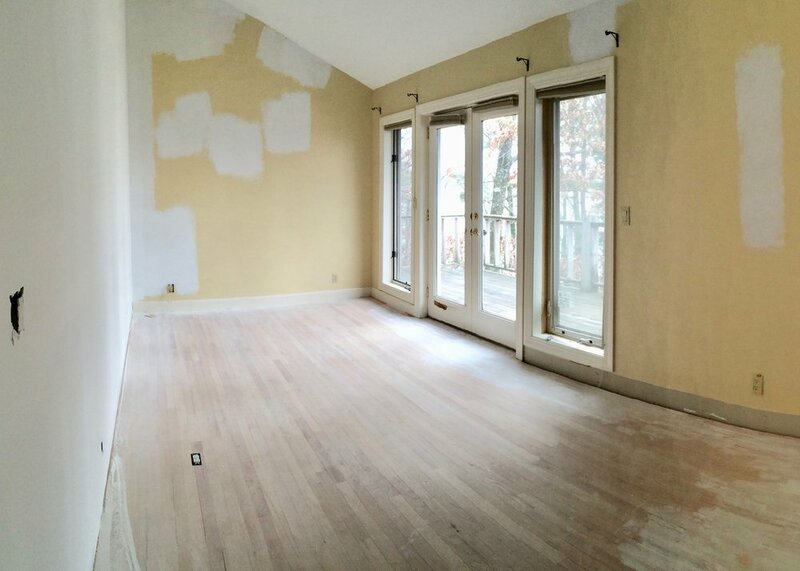 The upstairs wood floors were also refinished in the same rustic color as the downstairs. 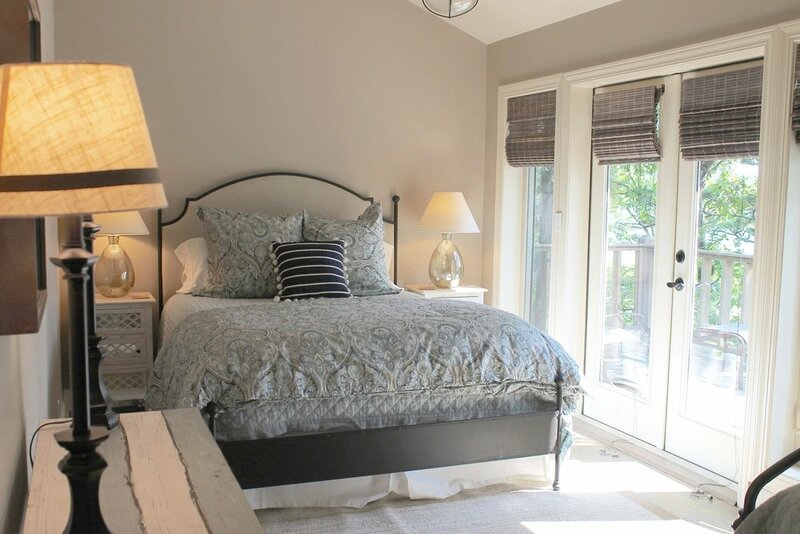 All of the walls were painted the same neutral taupe color and the bedding provided pops of color to add interest. Now the upstairs works well for entertaining lots of family and friends. The multi-colored checked tile floor was replaced with neutral tiles laid in an interesting pattern. The cabinetry was reconfigured to accommodate two sinks since this was the only bathroom upstairs which now sleeps a total of ten people. The navy toilet, tub, and counters were replaced with a granite similar to the one in the kitchen downstairs. The three bathroom mirrors are framed-in cedar reclaimed from the board and batten found on the exterior of the house. If you would like to learn more about this project, please contact us here!